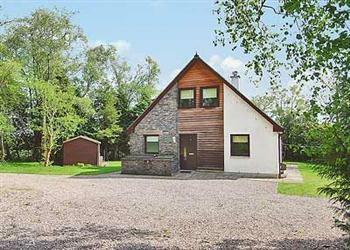 Greystonelea Lodge in Gartocharn, Loch Lomond sleeps 7 people. This comfortable, modern holiday cottage is in a quiet country setting with great views of open countryside. This area is within the Loch Lomond National Park so there are many beautiful walks and countryside to explore. Visit Balmaha Millennium Forest, Balloch Castle Country Park, Drymen village or go fishing in the loch or golfing at Loch Lomond. Loch Lomond shores is a unique mix of retail and loch cruises with a wealth of information on the local area. Glengoyne Distillery is only 7 miles away so you can enjoy a tour and a little ‘nip’. Shop and restaurant 2 miles, pub 21/2 miles. Ground floor: Living/dining room with French doors and tiled floor/ kitchen. Utility room. 1 twin bedroom. Wet room with toilet. First floor: 2 double bedrooms, one with additional single, one with French doors. Woodburner in living room included. Oil central heating, hot water from solar panel, electric, bed linen and towels included. Travel cot. High-chair. DVD. CD. Electric cooker. Microwave. Washing machine. Tumble dryer. Dish washer. Freezer. 120 acres of owners’ grounds. Sitting-out area and furniture. Balcony. Ample parking. Easy walking access. No smoking. Holidays at Greystonelea Lodge run from Saturday to Saturday. For a better idea of where Greystonelea Lodge is, you can see Greystonelea Lodge on the map below. Greystonelea Lodge is in Dumbartonshire; should you be on the lookout for a special offer, you can find all the special offers in Dumbartonshire. It's always worth checking to see what is on offer at the moment. Do you want to holiday near Greystonelea Lodge (26504), you can see other cottages within 25 miles of Greystonelea Lodge; have a look to find your perfect holiday location.